Cosentino Dekton Industrial Collection in the new Laos color. 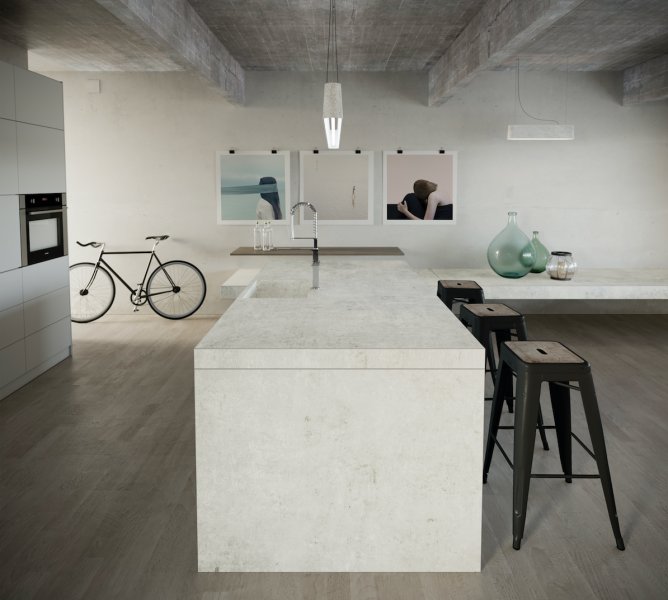 Surfacing manufacturer Cosentino has added three new colors to its ultra-compact surfacing brand Dekton Industrial Collection. The three new colors are Laos, Soke, and Lunar. Laos is a dark and weathered reinterpretation of the industrial look with golden tones, grey veining and a matte finish; Soke is inspired by traditional cement, with realistic cracks set over a detailed background of grays; and Lunar is a smooth structure and white base, offering an intriguing minimalistic yet modern approach. Dekton is an ultra-compact architectural surface that is ideal for both interior and exterior applications. The company says the surfacing is smooth to the touch and impervious to the elements, including scratches, stains, UV rays, and temperature shock. The Dekton Industrial Collection builds off the design by Phoenix, Ariz.-based architect and designer Daniel Germani. Now consisting of seven colors, it meets the demand for industrial-looking materials.